Gangnam Style or Call Me Maybe? PSY or Carly Rae Jepsen? This summer, the two songs/music videos have been nearly inescapable on the web and have sparked unpredictably enormous levels of interest and reaction. Comparing the popularity of two video phenomena can be tricky. There are a multitude of factors you could take into account. For example, if you look at how many views the two official videos has accrued, Carly Rae Jepsen's single has 250 million since it was posted March 1, while PSY has drawn 150 million since July 15. As you can see here, within just 2 months, Korean pop anthem "Gangnam Style" has increased to an average of over 6 million views per day. But you can also see that "Call Me Maybe" has had unusually strong staying power, averaging over 1.5 million views each day throughout the entire summer. That kind of sustained audience is uncommon and it still remains unclear just how long "Gangnam Style" will be around. NOTE: Not factored in here is another, star-studded "unofficial" video which helped kick off the "Call Me Maybe" craze back in February and March. "Call Me Maybe" has been a somewhat American phenomena, while the "Gangnam Style" craze has been a bit more global. 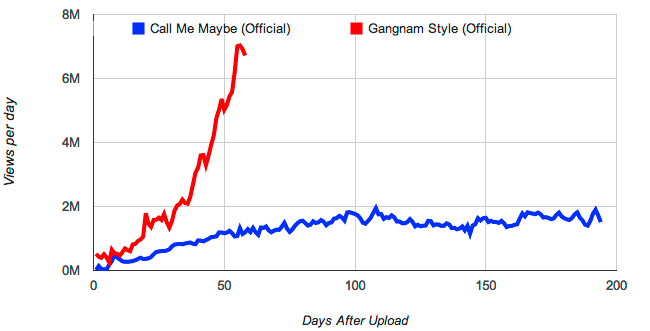 Much of the attention on "Gangnam Style" has focused on its outrageous music video, while the attention "Call Me Maybe" has gotten has been more about the song's pop culture spread. 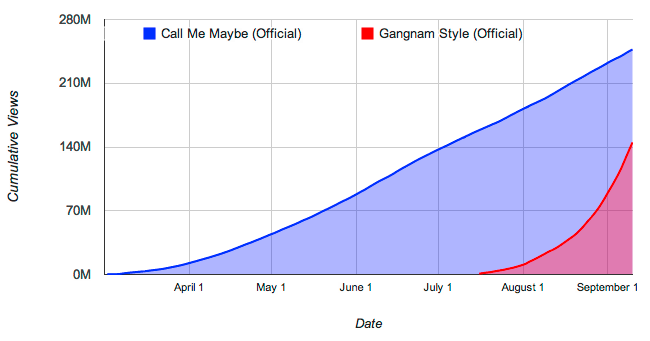 On the fan reaction front, PSY fan videos are just starting to appear, but videos mentioning "Call Me Maybe" have been seen nearly a billion times. Where we go from here no one knows. "Gangnam Style" is still taking off -- PSY teaching the dance to Ellen and Britney Spears has been seen 5 million times in two days this week -- and "Call Me Maybe" all these months later is still this week just behind it at #2 on the YouTube Music Chart.